With the new tax laws, the standard deduction nearly doubled to $24,000 (married couple) and $12,000 (single person). This makes the charitable deductions by donors a moot point unless they give beyond those thresholds. On the flip side, you can get that deduction even if you do not give in a certain year. 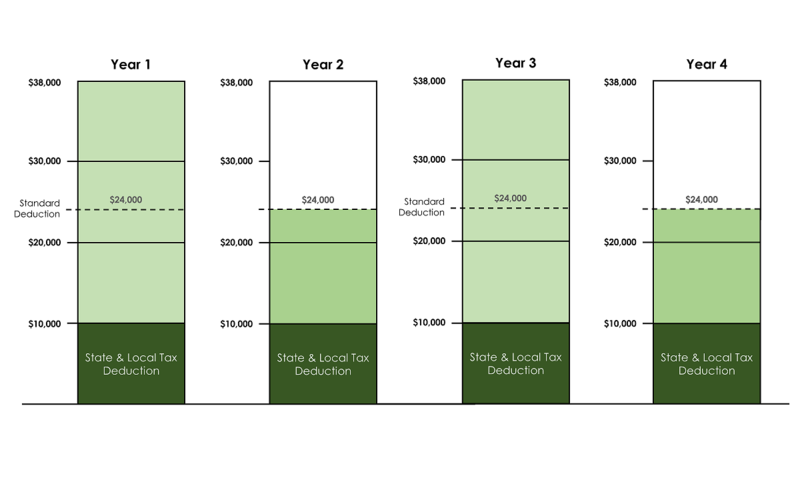 In alternating years, the relatively large charitable contributions, in combination with other itemized deductions like mortgage interest and state & local taxes will increase the likelihood of exceeding the standard deduction and thus provide the taxpayers with additional tax savings. By bundling or “bunching” charitable giving, you can use a donor advised fund to condense several years’ worth of giving into one year and gain the maximum tax benefits available. How does it work? In this example, donors (in this case a married couple) might normally make $14,000 of charitable donations each year. However, if they use a donor advised fund (DAF), they could bundle two years’ worth of charitable giving into one year, thereby exceeding the $24,000 standard deduction and gaining an additional $14,000 of deduction ($38,000 deduction minus $24,000 standard deduction equals $14,000 in additional deduction). The DAF allows them to make grants on their own timetable, which allows the donor to “level” out their charitable giving. This provides them the ability to still support their favorite causes each year to the amount of $14,000 that they were used to doing with their traditional giving. The money may also be invested depending on their giving strategy to the charities, potentially increasing the amount available for grant making. Furthermore, this technique becomes even more tax-efficient if the donors are able to fund the gift to the DAF using long-term appreciated marketable securities. They’ll be able to avoid paying the income tax on the appreciation on those securities, in addition to enjoying a full fair market value deduction for the gift. Contact us or call at 1-888-966-8170 with any further questions about how charitable bundling can work for you.